Darrell Johnson with his latest book, which he will introduce at Regent College next week. Darrell Johnson is well known around Vancouver, and far beyond, as a preacher and author. 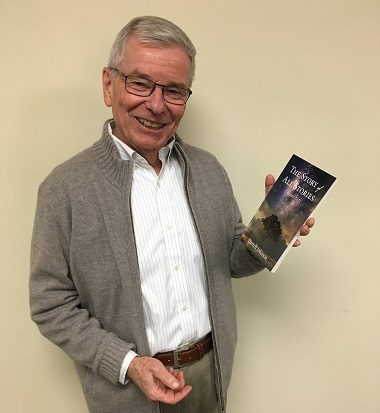 He will introduce his new book – The Story of All Stories: Genesis 1 – 11 – at a Regent College book launch next Wednesday (April 17). Following is an excerpt from the Introduction of the book. “Tell me a story.” Not just to entertain, although good stories certainly do that, but to help make sense of our lives, of the mystery of our existence. We are the creatures who are always seeking to understand who we are, where we are, and how we are supposed to be who we are where we are. And the primary, indeed, the primal way we do it is by telling stories. Every culture in every era in every part of the world has a story or cluster of stories it passes on to each succeeding generation to help it navigate the mystery of being human on this earth. In many tribal cultures a “rite of passage” into adulthood is the demonstration that one is able to tell such a story or stories to the satisfaction of the elders. This is still the case today in many parts of Asia, Africa and the Middle East, because the elders know that we simply cannot make our way in the world without knowing the stories that shape our understanding of the world. All of us – children, parents and grandparents – need stories that help us know who are, where we are, and how we are to be who we are where we are. This is part of the reason, it seems to me, we in the so-called West are presently a people adrift (I say “presently” because I pray that soon this will not be the case). We no longer have a compelling story to tell each other and to pass on to the next generations. Of course, we have all kinds of stories. The bookstore and online sources offer countless stories, and I enjoy reading many of them to our grandchildren or watching many of them on video – Superman, Star Wars, Frozen, to name a few contemporary examples. As powerful as they are, none of them finally satisfy. All of them are seeking to do what stories are supposed to do, but none of them finally help us make sense of our world. Thank God there is a story – actually, a cluster of stories – that has served this purpose in the past and can do so again in the present. It is the story that served as the foundation for Western civilization and, sadly, has largely been forgotten by Westerns, at least for now. I am referring, of course, to the story told by the Bible. This is the story I so long for my grandchildren to know, and it appears that the only way they are going to know it is by hearing it from me and from their parents. You may have a hard time imagining what I am about to tell you. I learned the biblical story/stories in public school! Yes, in Sunday school, but also in public school. Every Christmas season we actually read through the story as told by Matthew and Luke – in public school! The teachers never overtly argued for the truth of the story, but they did read it. I even learned the great Christmas carols in public school. Every Easter season we actually read the story as told by all four Gospel writers in public school. The teacher talked about the Easter Bunny and other such things, but he or she also said something like, “The Bible claims that a dead man came to life.” The same was true of Jewish holidays. Around the time of Passover, we learned about Israel being set free from Egypt, and we read from the book of Exodus. Can you imagine? This is why, by the way, we were able to go on to university and study art history, for example, and actually “get it.” When we saw a painting like Rembrandt’s Return of the Prodigal Son, we could enter into its reality because we had heard, somewhere along the way, Jesus’ great story about the father and his two sons. Today, if we were to take a group of average university students to the great art museums, they probably would not have a clue about how to interpret what is on the walls. If we were to take them to the Sistine Chapel in Rome and have them look up at Leonardo da Vinci’s masterwork upon the ceiling, most would have no clue as to what he was declaring and, perhaps even more sadly, would not have a clue about the final meaning of life being portrayed on the ceiling. Thank God, God himself has told a story – a great cluster of stories – in the 66 books of the Bible. 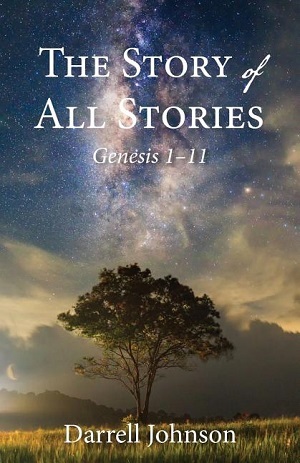 And the key to the whole story that these 66 books tell is the first “half” of the Bible – not the Old Testament, as one might think, but Genesis 1-11, the other half being all of Genesis 12 – Revelation 22. The story that begins in Genesis 12 with the call of Abraham and Sarah and then walks through the history of Israel, leading up to the coming of Jesus Christ and finally to the new heavens and the new earth, makes sense when it is heard in the context of the story in Genesis 1-11. The authors of the second half of the Bible assume we know the first half. This means that if our children and grandchildren, our friends and neighbours, are to understand the whole story God tells, we need to make sure they know the story that makes sense of the rest of the story. Why does it hurt to be human? Why can we human beings build impressive skyscrapers, make exquisitely beautiful art, play sports and compose and sing songs and then use one another for our own ends, manipulate laws, exploit the earth and kill? Why do human societies rise and flourish and then begin to rot at the core? What kind of God is he in all of this? Can the world be fixed? Who will do the fixing? The most important role of the stories in Genesis 1 – 11 is to help us realize why we need a Saviour and what the Saviour comes to do. When we inhabit the stories of Genesis 1 – 11, we come to realize just how good the gospel of Jesus Christ really is. So, let us listen to one of our great-great-great-great – on it goes – great-great-great grandpas tell us a story. Tradition says it was Moses. For the sake of simplicity, let us go with that tradition for now, and let us listen to Moses tell us a story. This is The Story That Makes Sense of All Our Stories. Rembrandt Harmenszoon van Rijn, Return of the Prodigal Son, c. 1661-1669, oil on canvas, 262 x 205 cm, Hermitage Museum, St. Petersburg, Russia. For a thoughtful examination of the answers that the Old Testament in general, and Genesis in particular, gives to questions like these, I commend to you Iain Provan, Seriously Dangerous Religion: What the Old Testament Really Says and Why It Matters (Waco, Tex. : Baylor University Press, 2014). This excerpt is re-posted by permission.